For the game master, a new plane of peril—Shadowsfall. This level 5 Adventure takes your gaming party to the Plane of Shadows. The head of the local militia and her children are missing and only the characters can rescue them. In this introduction to Shadowsfall, challenge your adventurers to brave the Land of Eternal Night. For the avid player, four sample 5th level characters showcase new player options for the Shadowsfall setting—a dhampir champion of innocents, a former angel seeking arcane secrets and a lost love, a bomb-toting kobold native to Shadow, and a fetchling profiteer from the zombie slave trade ready for play in your campaign. Designed to enhance your world and your game, this expansion supplies a one-page overview of Shadowsfall and features the distinctive monsters of Shadow created for the Book of Beasts: Monsters of the Shadow Plane—the newest in the award-winning series available at your game store today. Now Available at Paizo.com. Its free so download today. Very cool. I managed to win this in the raffle at my FLGS on Saturday, so having the PDF will make prepping to run this much easier. I too would like a print version, as my whole country (Australia) was a dry well. I managed to get a print copy, just made me want the players guide more though. I ran this on Free RPG Day at Jetpack Comics in Rochester, NH and luckily I had my own Kickstarter copy because I had a full table of 6 (there were 3 copies per kit ordered and Jetpack had ordered 2 kits so we had just enough to give out to the players afterwards). I had mostly inexperienced players and even a person who had never played before but everyone had a good time and the last encounter was pleasantly challenging. I will have my few remaining copies for sale at PaizoCon. Also, this option will be online soon. Unfortunately, I didn't pick up a copy of this on saturday. I knew that if I had it, I'd be tempted to spoil my game at PaizoCon. You can add it to your downloads and not download it right away. Heck, you can even download it and just go straight to the player's section. Blindness! Curse Blindness and its Permanency! Luckily, we still won out and the Paladin actually had a potion for removing Blindness. Definitely a great day with two great adventures back to back (Scarlet Sun and this one). I just want to say thank you for the awesome review. Thanks for making this - I really enjoyed reading through it and seeing the gamer-spirit alive in this FreeRPG-offering! I am preparing to run this, but have a question. On page 4, there are Human Fast Zombies. How do they get 3 slam attacks? I wondered about that myself when I ran this on Free RPG Day (back before I worked for JBE). So far as I can tell, they should only get two attacks, going by RAW. A word of caution: this adventure had a high casualty total when I ran it. Four players running pre-gens took out the dragon shadow, but the zombies in the temple combined with Sardiea's channeling bursts overwhelmed them. TPK. I let the zombies keep all three attacks, but I actually reduced the number of zombies called for in the module. Still had a dead party at the end of it. Short answer: right, left, right. Longer explanation: your basic zombie has the staggered ability. This limits their number of attacks to 1. Meanwhile, a normal monster with 2 arms/legs/claws/whatever, can make two attacks on a full attack. A fast zombie not only loses the staggered ability (which would allow it to make 2 attacks on a full attack), it has the quick strikes ability which allows it make an additional attack on a full attack. Thus 3 attacks. Thus a right, left, right attack. Oh wow. I had not even thought about that. Dale is right, and I am totally wrong. Meanwhile, a normal monster with 2 arms/legs/claws/whatever, can make two attacks on a full attack. Is there a reference in the Bestiary for that? Papa-DRB: he's right. If a monster has more than one natural attack listed, they can make them all with a full attack action. It qualifies as a special reason here, and the natural weapons section even talks about using natural attacks when mixing them with iterative attacks. I think he means in terms of three slam attacks vis-a-vis two, since some creatures gain "a slam attack" (like zombie and vampire) and others gain "two slam attacks" like dread mohrg. I don't see any reason that a human fast zombie would make three slam attacks rather than two (one for zombie gaining a single slam attack and another for being fast). Clearly a fast zombie can make a full attack in any way it chooses, adding an additional slam attack, but that would come down to either a weapon routine + slam, something like Claw/Claw/Bite/Slam for a lizardfolk fast zombie, or two slams for a human fast zombie, as the fast zombie template (as well as the vampire template and some others) does not grant two slam attacks on a full attack until you factor in quick strikes. The bestiary doesn't explicitly state that that is the case (to my knowledge atleast), however there are many more examples of creatures in the Bestiary with even a vaguely humanoid (walk on 2 "legs" manipulates the world with 2 "arms"), canine/feline shape (walk on 4 "legs") or avian shape (2 legs, 2 wings) and slam/claw/talon/etc attacks coming in even numbers rather than odd numbers. So if you exclude things like excluding things like elementals, mimics, plants, oozes, incorporeals and such, and you exclude those that are using 1 weapon and one claw/slam/etc those creatures in the Bestiary that do not have 2 arm-like natural weapons are limited to: good outsiders (all evil outsiders possess 2 claws/etc, while the good ones possess 1, go figure), lich's paralyzing touch (but I attribute that more to the limitations of the supernatural ability rather than being able to touch more than one creature per round), lizardfolk, mummy (like a lich, I attribute that to a limitation of the supernatural ability mummy rot), vampire (outright states it can only be used once per round), and wight (see lich). Counting each of the good outsiders individually, that is a total of 10 monsters in the bestiary that do not have paired arm/leg based attacks. in even numbers. Considering that B2 and 3 have all humanoid looking angels, archons and azatas with either even 2 slam attacks or none, I'd say that if B1 monsters were redone, those good outsiders with a single slam attack would be altered (so exclude them for a moment). Then if we exclude all examples of monsters with supernatural damage on the melee attack, we are left with 1 example of a roughly humanoid/canine/feline/avian shaped monster with an odd number of arm/leg attacks: the lizardfolk. So while nowhere does it outright state that a zombie without the staggered ability and without the quick strikes ability would get 2 slams, it is safe to infer that it would. If you want to use the fast zombies with 2 slam for your game, that's ok. Its better for your game. Ok. Gotcha. While I don't rules lawyer at the table when I am playing, I do like to understand more fully when I am DM'ing. Thanks for the explanation. 3 slam attacks, including the quick strikes one, is fine. Just trying to understand, is all. That's a solid survey! I bet the lizardfolk is even actually an erratum--it doesn't even make sense that it doesn't have two claws. The only other one I could find in there was the yellow musk zombie with one slam, so that seems like a good preponderance in favor of two slams being pretty standard (though admittedly yellow musk zombie is a near neighbor). I'm becoming convinced towards a middle stance by the data, but since there's an Undead Lord in one of my games whose zombies would be affected, I wonder if Paizo ever included fast human zombies in a product to give us the official answer? This book is Powered by Hero Lab and includes a Hero Lab file in the download, making it easier to integrate into your game. 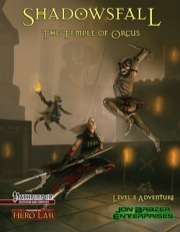 With the upcoming I'm Not Going to PaizoCon Sale, you can grab the Shadowsfall: Temple of Orcus for $1. It starts Wednesday. Add this to your cart today. Just got home from PaizoCon? The I'm Not Going to PaizoCon Sale is still going on, but ends soon. Grab Shadowsfall: Temple of Orcus for $1 before it is too late. Looking for a great adventure for a really low price? This one is awesome! Download today. Want to take a quick trip to the plane of shadows? Here an adventure just for you. If I do have one regret for Pathfinder, it is that we do enough with Shadowsfall. Would you like to see us do Shadowsfall (and make a major commitment to it) in PF2e? I am not familiar with the 3rd-party settings, but if it is both fun to write for and fun to play in based on the feedback you have received, I say go for it.